Some tweens and teens equate back-to-school with braces. And plenty of parents recall moments like, “I got my braces in 7th grade.” Wherever you fall on the spectrum, the important thing to keep in mind is that youth braces don’t have to be a downer. In fact, you may just love the idea of debuting your orthodontia come day one of a new school year. For most tweens and teens who need braces, it should come as no surprise when the day arrives that the orthodontist says it’s time to start treatment. These kids know they have crooked teeth or alignment that’s out of whack. They must finally own up to the results of their thumb-sucking or deal with their genetic luck. Options are a great way to make braces more palatable for these patients. Conventional braces now use smaller brackets and hardware, making them less noticeable and less uncomfortable. The braces can be ceramic, which blends in more nicely with tooth color. Or, for the flashier teen, colorful bands and accessories can be part of their orthodontic journey. If you must wear braces, might as well make it fun, right? Some teens are in denial about braces. 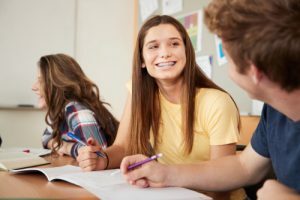 They simply do not envision their youth as including braces and they’re blindsided by the diagnosis of “needs orthodontia.” In some cases, if it wasn’t obvious that braces would be inevitable, the discreet Invisalign Teen could be a viable option for the teens who are really uptight about wearing braces. Teens who play sports or instruments may also be concerned about how braces can interfere with their extracurricular activities. Talk to your Center City orthodontist about how to work around these interests and the wearing of braces. For example, mouth guards for athletes can make braces and your passion coexist easily. At the start of the school year, some children find themselves in the orthodontist’s seat long before they are ready to undergo full-blown orthodontic treatment. Interceptive orthodontics treat early alignment issues. Spacers and other hardware can be used to potentially help minimize the intensity of orthodontics needed when the teen years arrive. Plus, they give a growing kid more confidence now knowing that their dental issues are being tended to early. Parents and teachers want straight teeth too. Back-to-school is a great time of year to prioritize your own oral health needs while your kids are busy at school. Adult braces can happen discreetly with Invisalign or, depending on your misalignment, almost as discreetly with ceramic conventional braces. The most important thing is to take care of your smile. Straight teeth are healthier teeth. Schedule a consultation at Roberts & de Marsche, the orthodontic practice serving Center City, Philadelphia and Lawrenceville, NJ, to learn more about youth braces.